Astronomers haveaccurately measured the distance between Earth and a particular black hole forthe first time. And wow, is it close. The researchersdetermined that the black hole V404 Cygni is located 7,800 light-years fromEarth ? or just slightly more than half the distance that was previouslyassumed. That puts itrelatively nearby to Earth, where the distance to the center of the galaxy isabout 26,000 light-years, and the nearest star beyond the sun is a mere 4.2light-years away. The moreaccurate distance measurement will enable scientists to paint a better pictureof how blackholes evolve, the team says. "Forexample, we hope to be able to answer the question as to whether there is adifference between black holes that evolve directly from the collapse of a starwithout a supernova and black holes that evolve via a supernova and a temporaryintermediate star,? said study team member Peter Jonker of SRON NetherlandsInstitute for Space Research. "We expectthat the black holes in the last group can get a kick. 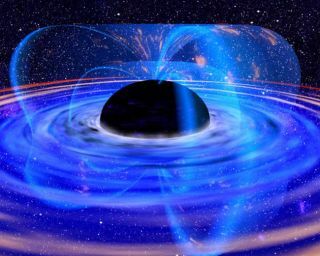 Black holes formed inthis way could then move through space faster.? Jonker and histeam measured the distance to V404 Cygni by measuring radio emissions from the blackhole and its associated dyingstar. The outermostlayers of the star are being siphoned by the black hole. The swirling gas formsa hot plasma disk around the black hole before it disappears, and the processemits a lot of X-rays and radio waves. Using aninternational system of radio telescopes called the High Sensitivity Array, theteam measured the so-called parallax shift of the black hole system. Thismethod involves measuring the annual movement in the sky of the black holesystem as a consequence of Earth's orbit around the sun. The team saysthe previous overestimation of V404 Cygni's distance was due to anunderestimation of the absorption and diffraction of interstellar dust, whichcan give an error margin of about 50 percent. The error margin of the newmeasurement is less than 6 percent. The research wasdetailed in the Dec. 1 issue of The Astrophysical Journal.